Returning for the third year, ABC’s “The Chew” will be back to tape five festival shows that will air October 9-13. With Spaceship Earth as the backdrop, the Emmy Award-winning show hosts will again delight a live audience with on-stage cooking and stories of their Disney adventures plus segments from across Walt Disney World Resort. “It’s magical to see our Epcot stage light up as the show’s celebrated hosts cook, dish and entertain each live audience of festival guests,” says Epcot Vice President Melissa Valiquette. Creative cuisine inspired by “The Chew” also will be featured at “Earth Eats Marketplace, Inspired by The Chew.” Three dishes at the marketplace include Grilled Beef Skewer with Romaine, Apricots and Feta Cheese; Ricotta and Zucchini Ravioli with Rustic Tomato Sauce and Peanut Butter and White Chocolate Mousse with Caramel Drizzle. And at the Festival Center, guests can watch screenings of “The Chew” show highlights, cooking and entertaining tips. Four ABC shows will offer sneak peeks into the new land coming to Disney’s Animal Kingdom. As “The View” broadcasts from Disney’s Animal Kingdom this week, several other ABC shows will be joining forces on Thursday, March 9, for a look into the highly-anticipated Pandora – The World of Avatar. The day of sneak peeks kicks off with “Good Morning America,” where viewers are introduced to Pandora – The World of Avatar including a first look at the thrilling attraction, Avatar Flight of Passage. After that, viewers can tune in to “The View,” where James Cameron will take Whoopi Goldberg into the immersive new land, including a look at the Na’vi River Journey. Rounding out the daytime segments, the hosts of “The Chew,” true to their culinary stylings, will introduce viewers to the Lumpia, a unique and delicious snack found on Pandora. Later that night “Nightline” will offer an in-depth look at Pandora – The World of Avatar in a unique segment inspired by the stories of the land. Pandora – The World of Avatar opens May 27, 2017. The popular, affable co-hosts of ABC’s “The Chew” are returning to Epcot International Food & Wine Festival to tape a week’s worth of shows October 5-7 – look for Mario Batali, Michael Symon, Carla Hall, Clinton Kelly and Daphne Oz at Walt Disney World Resort as they explore the festival and beyond for the Emmy-Award-winning series. (The taped shows will air on ABC October 10-14 at 1 p.m. EST, 12 p.m. PT — check local listings). Audiences will again get to be part of the taping as the co-hosts share festival highlights, recipes and dining from the four Walt Disney World Resort theme parks and Disney Springs. The show will have a presence throughout the entire 62-day festival at The Chew Collective marketplace in the Next Eats festival area of Future World with two savory dishes – Grilled Beef Skewer with Romaine, Apricots and Feta Cheese, and Ricotta and Zucchini Ravioli with Rustic Tomato Sauce – and one sweet — Peanut Butter and White Chocolate Mousse with a Caramel Drizzle. You can pair tastes with this year’s exclusive new festival Chardonnay and Cabernet Sauvignon that will be served at The Chew Collective. And at the Festival Center, guests can watch screenings of “The Chew” show highlights, cooking and entertaining tips, and same-day episodes of “The Chew” Monday through Friday at 1 p.m. 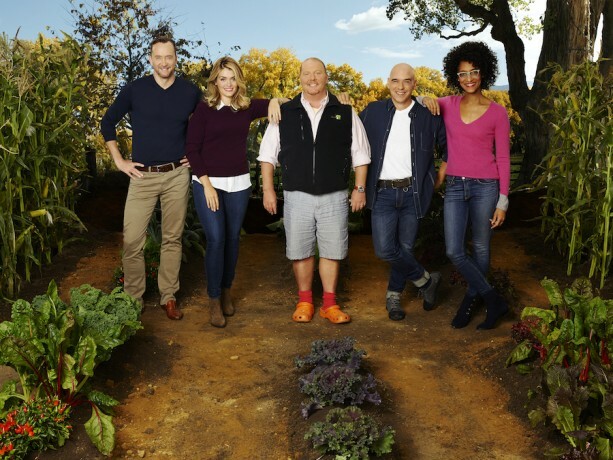 Ahead of this year’s festival – the week of July 25 – fans can watch a re-broadcast of “The Chew” 2015 shows taped at Epcot as part of the network’s summer programming lineup (Monday-Friday, check local listings). Instructions on how to obtain show taping tickets will be announced at a later date. For updates about festival events and premium experiences, visit epcotfoodfestival.comthroughout the summer. For the first time ever, ABC’s “The Chew” left their studios last week in New York City and took their daily “party in the kitchen” to the Epcot International Food & Wine Festival at Walt Disney World Resort to tape five shows airing this week (October 12-16) on ABC. Hundreds of enthusiastic fans cheered on Clinton Kelly, Carla Hall, Mario Batali and Michael Symon on the custom-built set with the backdrop of Spaceship Earth under Florida’s sunny skies. We had a special performance from the cast of Disney’s “Festival of the Lion King” from Disney’s Animal Kingdom. They opened one of the shows (airing this Thursday) with a powerful dance – just one of the many “only-at-Disney-World” moments the foursome experienced during their weeklong stay. Wonder what each of the hosts did just after arriving? Carla said she headed straight for Disney’s Animal Kingdom and Kilimanjaro Safaris. Clinton racked up a big score on Toy Story Mania!, while Mario took the plunge on the Twilight Zone Tower of Terror, both at Disney’s Hollywood Studios. And Michael took a leisurely boat ride through the hydroponic growing area at The Land pavilion in Epcot Future World. We all have a favorite host from ABC’s “The Chew” – superstars Mario Batali, Michael Symon, Clinton Kelly, Carla Hall and Daphne Oz each have a special way of sharing their culinary know-how on the Emmy-Award-winning lifestyle series. And for the first time in the show’s history, these dynamic hosts are leaving the Manhattan studio to tape shows October 7, 8, and 9 from the 20th Annual Epcot International Food & Wine Festival at Epcot. The five festival episodes will air October 12-16. Shows will be taped before a live audience (visit thechew.com for information on how to obtain tickets), and we’re sure the hosts will be all over Walt Disney World Resort discovering remarkable dining finds, getting a taste of innovative, fun and healthful eats – the best the vacation kingdom has to offer. Along with the taping of the show, “The Chew” will be featured in two marketplaces throughout the festival’s 53-day celebration from September 25-November 16, helping celebrate 20 delicious years. For the first time in the festival’s history, marketplaces will expand into Future World in the new Next Eats festival area with three delicious dishes from “The Chew” in their Sustainable Chew Marketplace: Savory Pork Spareribs with Cheesy Mascarpone Grits; Ricotta & Zucchini Ravioli with Tomato Sauce, and Vanilla Panna Cotta with Fresh Figs and Pistachio Brittle. (Herbs and veggies from The Land pavilion will flavor the marketplace dishes when harvested.) The eco-home-inspired marketplace will offer a chance for guests to learn more about how food is grown and the importance of sustainability. Also in Next Eats, Disney chefs are collaborating with “The Chew” for the Chew Lab, a cutting-edge marketplace inspired by food-science labs and the hottest culinary tech trends. “The Chew” airs on ABC Monday through Friday at 1 p.m. EST, noon CST. For updates on the Epcot International Food & Wine Festival, visit epcotfoodfestival.com throughout the summer. Disney News Today Blog at WordPress.com.